Army SGT Thomas Bohall died May 26, 2011 of wounds sustained when insurgents attacked his unit with an improvised explosive device in Spin Boldak, Kandahar province, Afghanistan. Also killed were 1LT John M. Runkle, SSG Edward D. Mills Jr., SSG Ergin V. Osman, SGT Louie A. Ramos Velazquez, and SPC Adam J. Patton. “Thomas not only loved life, he loved to live…and there is a difference. He was always looking to throw himself into the next task, adventure or opportunity to help another. Whether that might have been helping dad build a bridge across the creek on the back acreage, or the next opportunity to sky dive, or the chance to spur his teammates to greater heights on the athletic field, Thomas never backed away from an opportunity to bask in the joy of living. Thomas definitely “danced the dance”! I do not believe the term “fallen soldier” accurately describes the Thomas that I knew. No, if Thomas had simply fallen, he would have risen back up to face whatever caused him to fall. That’s the way he was. He always got back on the horse. He always jumped back into the play. He always resumed the task at hand. No, I believe Thomas did not fall; I believe that Thomas rose up. On that terrible day I believe that he lifted himself and others to meet the challenge at hand, and that he stood tall, and will always stand tall, not only for America, but for all of the persons in the world who long for a taste of freedom, who yearn for opportunity, who hunger for the chance for a better existence, and who thirst for the promise of a better life. That was the Thomas that I knew, and I believe that is the Tomas who met his fate that day. 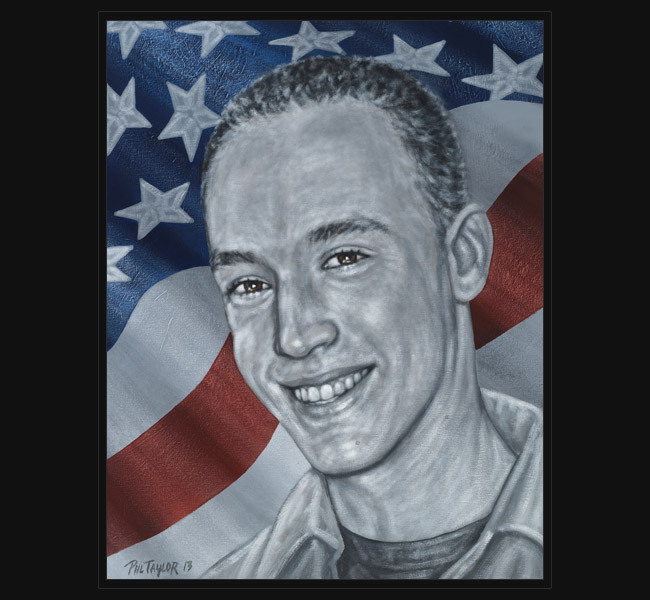 Original portrait was presented December 9, 2013 by artist Phil Taylor to the Bohall family during the Caddy for a Cure golf tournament in Parkland, Florida.